The biggest problem most people have with the New Year are the resolutions they set. The same holds for your business. 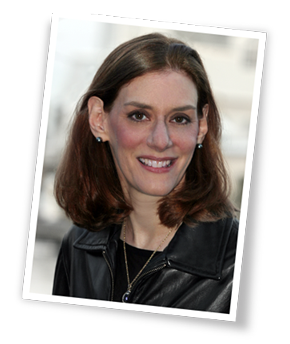 They make New Year’s resolutions involving big audacious goals that are difficult to attain. It’s like they’re small children who believe that their fairy godmother is going to come along and bop them on the head so their resolutions magically come true. The reality is that most New Year’s resolutions have a limited shelf life that’s shorter than the average quart of milk. Don’t take my word for it. Observe your favorite gym. Their sales people can’t sign new members up fast enough and their classes and facilities are jam packed for the first couple of weeks of January. Then attendance falls off. Bear in mind that, just because you hit your 2014 revenue and ROI objectives, it doesn’t mean that your business is healthy and can support growth for 2015 and beyond. When I was working at a major international bank, one region had an amazing year in terms of sales and profits, yielding high fives and bonuses all around. BUT closer examination of the sales revealed the team’s results were attributable to a single, non-recurring transaction. This was a huge RISK, especially for a business dependent on recurring revenue streams. Without the one deal, the division’s sales were down year over year. Compounding the problem, customer attrition had increased, revenue per customer had decreased and new customer acquisition was down. This made the region’s potential for maintaining flat sales a major challenge. Examine your business’s 2014 performance across a variety of indicators regardless of whether you reached your 2014 goals or not. Manage your current business results to build a foundation for long-term growth. Don’t chase the next big viral hit. Keep your marketing on track while testing new options. As my mother taught me, you have to keep putting one foot in front of the other to achieve your goals. Before you dive into the details of your business, look at your financial results. Many marketers want to skip to this step since it involves numbers, but without this knowledge you’re driving blind. Assess your organization’s 2014 performance, specifically your revenues, expenses and profits, versus 2013. What was the variance in dollars and percentages? Measure your organization 2014 performance versus your budget for your revenues, expenses and profits. What was the variance in dollars and percentages? Select your biggest 2014’s successes. What caused them? Highlight your biggest 2014’s failures. Was there a reason they under performed? Examine your results without these one-time events. How does your core business growth look? 2. Determine your organization’s vision for 2015 and beyond. Before you dive into the other aspects of your marketing, take the time to ensure that your business’s long-term vision is still on target. Define your business’s overall vision. What are your top-level goals? How do they fit with your business’s history? Here are the only 3 business goals you’ll ever need! Reassess your 3-year plan. Does it need to be modified based on your 2014 performance? 3. Understand your target market. Prospects, customers and influencers are key to your business’s health and future growth. Analyze how your audience has changed over the past year to develop new marketing persona and social media persona. Assess your customer base at the end of 2014. Measure the number of customers. Is it growing or declining? Do you have a high churn rate? Examine your customers by products. Is there a change in what customers are buying? Are your sales per customer increasing or decreasing? Analyze your customers by tiers. Has there been a big change in your top and bottom customers? Check your customers by how recently they’ve purchased. Bear in mind that new customers tend to purchase more. Assess your audience’s needs. How have they changed relative to your products? Do you need to make changes? Look at your best customers. How do they differ from the rest of your customers? Do you have special plans for them? Examine your worst performing customers. Did something change in 2014? Are they costing you money? Are you planning to unmarket (aka get rid of) them? Align your marketing, sales and customer service. Make sure that your customer service department knows what’s in the pipeline. Improve cross departmental communications. Get customer service and sales into the marketing process. This is particularly important so that you don’t keep reinventing the wheel. 4. Examine your competitive environment. No business operates in a vacuum. Factors outside of your business can have a major impact on your results, especially if you’re not paying attention to them. Look at the macro economic and political environment for 2015. What do the 2015 predictions mean for your business? Do you foresee potential changes that will have an impact on your business? Assess how your direct and major competitors are doing. Monitor the major players in the marketplace. This means Walmart, Amazon, Facebook, Apple and Google. Are there possible changes that can help or hurt your business? Examine your peers. Are they making changes for 2015. Should you do the same? Evaluate your suppliers. How are they positioned in the market? Are there changes that could affect your business? Review your distributors and their position in the market. Were there changes in your network that could have an impact on your business? 5. Assess your product offering. Check your product offering to determine whether it’s still relevant and what related products you may need. Look at how your product or key product lines are performing. Do you have new products or changes planned for 2015? Are there products that you’ll stop selling in 2011? Consider new and emerging technologies. Do you need to make changes to your product set in 2015? Determine product gaps based on market and/or technology changes. Consider how you can fill them. In the current marketing environment, it’s critical to understand how your target audience buys from your business. Regardless of your offering, assume that your shoppers will start their process with online research. Note: While many of these factors may appear to be B2B oriented, all businesses should look at these factors. Analyze your sales process to determine sales conversion effectiveness. Do you have points where you’re loosing prospects? Determine the average length of your sales conversion. Has it grown in length? Do you need to add special marketing at strategic points? Assess the health of your lead generation. Are you capturing sufficient leads? How is your lead quality? Analyze whether you’re getting repeat business from your customers. Do you have issues that need to be addressed? Are there other needs you can fulfill? Evaluate your key conversion pages. Are they streamlined? Can you speed up the process? Are you rushing to close the sale? 7. Develop your 2015 marketing plan. Here’s where you pull the different elements of your marketing together to achieve your overarching business objectives for 2015. Create your key marketing objectives associated with your business goals. They should be measureable. Incorporate every customer touch point to reach your target audience, leads, prospects and customers. Develop an overarching creative strategy that’s up-to-date. Create a mobile marketing strategy. Bear in mind that your content should be developed for mobile first. Integrate your marketing across devices and platforms. Determine how to leverage your physical presence (if you have one) to merchandise your business. Include a PR strategy into your communications plans. Consider whether offline media is necessary. If so, is it still yielding sufficient response? Examine your housefile. This refers to how you’re collecting customer contact information (with permission of course!) including physical address, email address and mobile phone (where appropriate). Establish your 2015 promotional calendar. Include at least one promotion per month. Supplement your promotional calendar with special product related events and holidays. These are useful hooks for promotions and content creation. Plan special value promotions for 2015. Of course, it’s critical that your promotions aren’t just discount-based. Create a series of customer-initiated communications. This is a series of communications when prospects first reach out to you. Develop a set of targeted promotions for your top customers. Determine what type of engagement they want from you. Incorporate attending major conferences in your category. The objective is to meet people and gather the latest knowledge. Include a plan for testing different elements of your marketing plan. The objective is to improve your processes. 8. Define your 2015 content marketing strategy to support your sales process. Research has proven that businesses with a well-defined and documented content marketing strategy perform better. Align your content marketing strategy with your overall marketing plans. Include all marketing and corporate communications across your organization to maximize effectiveness and minimize content creation costs. Audit your existing content. This is key to ensuring that your content is current and has appropriate metadata. Build your 2015 editorial calendar. Incorporate all necessary content for your marketing and social media strategies. Provide the 5 basic content formats your audience seeks across the purchase process. Schedule curation of your existing content. Make sure that relevant content continues to be promoted. Establish at least one key thought leader within your firm. Get recognized for your work. Plan your email and newsletter communications. Do all of your content creation at one time so that you can plan for reuse. Include guest blogging and article placement in your editorial calendar. Tap into other people’s audiences. Limit yourself to one internal link. Incorporate cross-organizational communications in your content marketing plans. This includes HR and other content. It helps eliminate duplicate effort. Include investor relations content. This is expensive content. Don’t keep it as a one-off project. Plan to create all similar content at the same time. The objective is to reduce costs. Re-imagine different pieces of content for each media platform (including social media.) Here’s help with re-envisioning your content. 9. Expand and deepen your social media presence to drive traffic and sales. 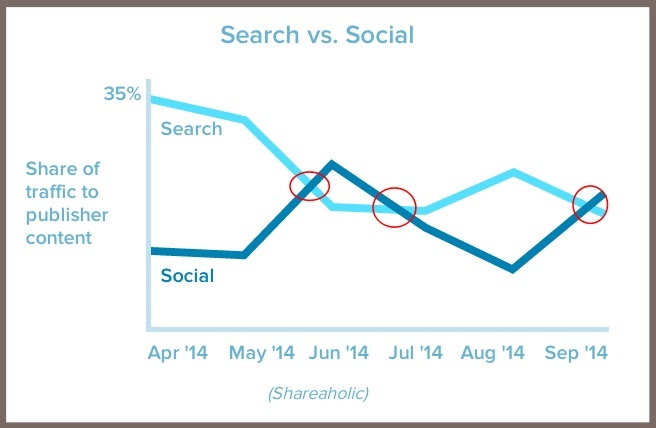 In 2014, social media exceeded search for discovering new content. Assuming that this trend continues, you must adapt each piece of content to be contextually relevant to each platform. Monitor the social media landscape. It’s important to understand how your business is perceived and what’s hot on these platforms. Create a set of corporate social media guidelines for what employees can and can’t do. This enables you to expand your reach by leveraging your staff’s reach. 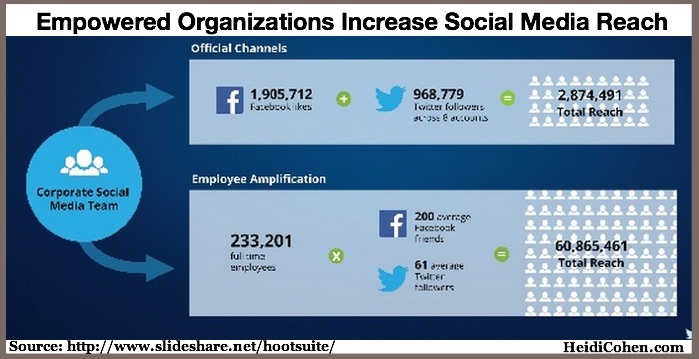 Develop a tailored channel strategy for each of the major social media platforms where you engage. At a minimum, a targeted strategy for Facebook, YouTube, LinkedIn, Twitter, Pinterest, Google+ and Instagram. Publish content on LinkedIn Publishing. Take advantage of this relatively new platform to expand your reach. Leverage the power of SlideShare. This is particularly important for B2B marketers. Add a regular video to your marketing mix. Distribute your video across platforms to maximize reach. Test the use of a podcast. It’s audio content that can reach listeners when they’d otherwise be using different media. Think one-to-one radio. Create supporting marketing where necessary. Make sure that prospects don’t just arrive at your website and disappear without taking action. Review your organization’s crisis management plan. Update it if necessary. 10. Continue enhancing your brand. Branding enables your audience and the public to recognize your products, content and interactions regardless of where they appear. Regardless of size, business must continue to keep their brand top of mind and make it visible. Assess your brand. Does it need to be modified to be more relevant in 2015? Adapt your brand to a 360° approach. Is it recognizable on social media and different devices. Evaluate how your brand stands out in real life. Make sure that your audience knows your products when they see them. 11. Optimize your marketing for search (and social). While data shows that social has passed search in the amount of traffic it drives, don’t overlook the potential of reaching people who use search. Examine your firm’s search optimization strategy. 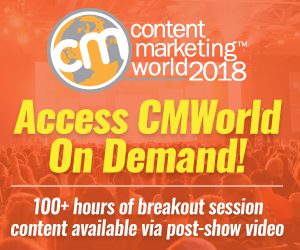 Is it connected with your social media and content marketing strategies? Does it include mobile search? Optimize non–text content formats. Don’t limit your optimization just to text. You never know how your audience is looking. According to Google, roughly 15% of searches are new each day. Include social sharing icons. Let your readers help you distribute your content. This includes printing!!! Make it easy for readers to share different content elements. This means include images and videos. Create special pinboards for your own content. This is a page out of the BuzzFeed playbook. Craft amazing headlines. As David Ogilvy said, “Only 20% of people will read past the headline. Although many small businesses try to get around the use of advertising, for some businesses it’s a necessity. Align your advertising spend with your audience’s media use. Don’t just spend money on advertising without making sure it’s supporting your marketing objectives and is aligned price-performance wise. Add social media advertising to support your content. Take the time to assess the potential to drive more readers and buyers. Where possible take advantage of their user data to target your ads better. 13. Empower your staff to support your business objectives. Many businesses underestimate the power of their entire workforce to help create and distribute your marketing. Assess your current headcount. Does your organization have sufficient staff to achieve its 2015 goals? Are you missing specific expertise? Can this support be outsourced or do you need to you hire people with these specialized skills? Determine whether your organization is at risk of losing key executives or staff in 2015. Create a plan to keep them (if possible). Give your employees the tools they need to support your organization’s goals. This means training in content creation and social media. Align your employee goals with your business objectives. This extends beyond their basic jobs. Streamline redundant work, especially where marketing related activities are concerned. 14. Ensure that your technology is up-to-date. Business runs on technology. Therefore it’s critical that your business is up with the times or you risk being surpassed by a competitor who is. Audit your organization’s technology such as hardware, bandwidth, etc. Is it sufficient to achieve your goals for 2015? If not, how will you bring it up to date? Track your firm’s software. Are you keeping track of it and is it up to date? Determine whether your information is secure. This extends to your internal documents as well as your customer data. Do you have a security policy and protocols? Evaluate whether you have sufficient technical support. If not, will you hire more people or find other alternatives? Track the technical skills of people who interact or use your technology. This means non-technical staff that use or interact with these systems. Where appropriate, provide training. Ensure computers and devices are backed up regularly. This one is easy to overlook. 15. Measure your marketing success. Whether you like it or not, marketing runs on results. Therefore metrics are critical. The good news for numberphobics is that most of the numbers involved are close to the arithmetic you learned in elementary school. Determine your 2015 metrics. Do they differ from your 2014 metrics? 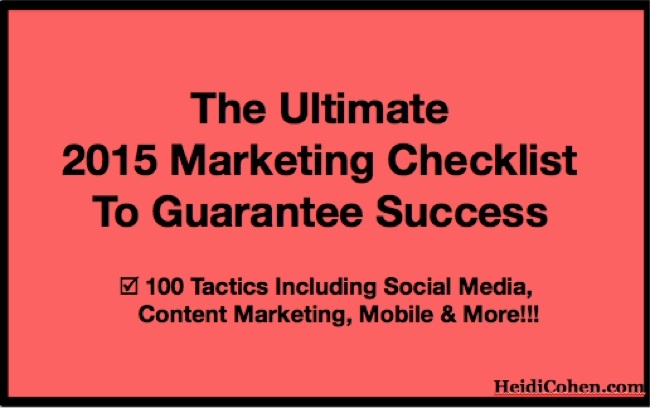 Will you use your 2014 results to compare your 2015 progress? Have you incorporated the interim steps towards sales? Include a contextually relevant call-to-action to maximize results. Don’t forget to ask readers to take the next step in the process. Limit the options you offer prospects. The more alternatives consumers have, the more likely they are to put off making a decision. Make it easy for them to say yes. Assess your organization’s cashflow. Do you know how much money you have coming in and going out? Track how your brand and firm are perceived. This is a soft measure and can include sentiment analysis. But it’s important to see the world through your customers’ and the public’s eyes. When starting your plan for 2015 success, examine all aspects of your business. Where appropriate integrate new, more effective tactics for existing ones. 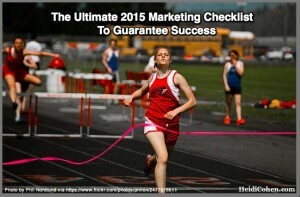 Use The Ultimate 2015 Marketing Checklist to highlight issues and opportunities you may have overlooked in 2014. This happens in big companies as well as small ones. To be successful in the long term, you must think strategically. A good place to start is tracking your marketing results against the same period last year, if you have them, rather than just your budget. Also test each element of your marketing to maximize your results. What are marketing elements would you add to this list? Please include your suggestions in the comments section below along with your rationale for adding it. BTW–Here are our 2015 Content Marketing Predictions (with 35 actionable tactics) and our 2015 social media predictions. Tags Checklist. Bookmark the permalink.